The 10 Best Camping Spots in West Virginia! The Mountain State is home to beautiful sites for those looking to become one with nature. 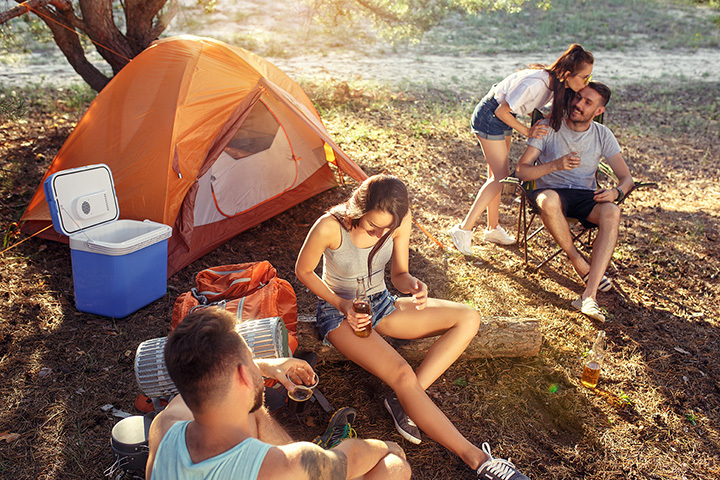 There is no lack of choices for excellent campgrounds in West Virginia, so pack up your equipment and get ready for an adventurous getaway. Here are the 10 best camping spots in the state. Summersville Lake is among the very best places to camp in West Virginia and visitors have two choices for campgrounds: Battle Run and Mountain Lake. And if you like primitive camping, you can pitch your tent near the Summersville Dam, but plan and reserve quickly since spots are often booked a year in advance. Spruce Knob Campground is part of the Monongahela National Forest in Whitmer, West Virginia. Boating is allowed but not swimming, and over 60 miles of picturesque hiking trails are available throughout the area. Spruce Knob has a unique climate that is similar in places much farther north and an interesting variety of flora and fauna can be found there. The history of Coopers Rock in Bruceton Mills, West Virginia, is an interesting one with how the name was chosen and the fact that several of the buildings scattered in the forest were built out of the now extinct American chestnut trees and are on the Historic Registry. There's a six-acre trout pond for those who love to fish and plenty of beautiful hiking trails that offer scenic overlooks to delight the outdoor photographer. With over 15 campsites that offer everything from bare bones primitive camping to modern RV hookups, New River Gorge allows overnighters to be close to what they love best—white water rafting, scenic overlooks, historic areas, and everything in between. Boating, fishing, and wildlife viewing are the best experiences of Beech Fork State Park in Barboursville, West Virginia. There are 275 camp sites, with 80 being situated right on the lake. These spaces fill up quickly, so remember to reserve your spot quickly. Horseback riding, biking, trails, and a spacious lodge for overnighters are just some of the features of North Bend State Park in Cairo, West Virginia. With over 2,500 acres of wooded space, a new 305-acre lake was recently added that offers fishing and boating. Voted among the “50 Great Places to Stay for a Dream Weekend” in Washingtonian Magazine and one of “America’s Best Parks” by Arthur Frommer’s Magazine, Canaan Valley in Davis, West Virginia won't disappoint. From the breathtaking views of Blackwater Falls in the summer to the average 180 inches of snow in the winter, this park has everything the outdoor enthusiast wants. Located on the Middle Fork River near Alum Cave, Audra State Park is not one to miss. There's a wildlife center featuring flora and fauna native to West Virginia and an amazing 1.25-mile interpretative trail that's also handicapped accessible through a hardwood forest. One of the Army Corp of Engineers' projects, Lynn Lake was developed for flood control, but is also used for fish management and recreational use. With a gentle slope upward into the woods surrounding the lake, there are nearly 46,000 acres to explore. There is a wide variety of waterfowl and animals, and other activities nearby include fishing, water skiing, boating, and swimming. Hikers, bikers, photographers, and those who just love being outdoors will love Big Bear Lake in Bruceton Mills, West Virginia. Because this area is privately owned, it's is one of few campgrounds where you can purchase property if you're so inclined. There's a miniature golf course, 24 miles of hiking trails, a game room, and live music during certain times of the year.